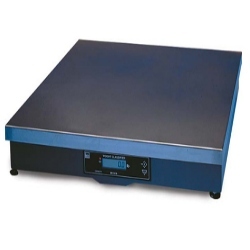 NCI7824 and parcel scales are suitable for heavier or oversized items. They are as big as 24 inches, able to handle most large parcels or containers. These bench scales have a high capacity, up to 150kg/300lb and are switchable between lb/kg for added flexibility. Platform: 24"x24". Model 7824 shipped only by motor freight on a pallet. The NCI Model 7824 Bench Scale provides the most accurate and reliable weight measurement for static or inline shipping. The weighing solution for any application requiring a durable bench scale. Fast Digital Response – Speeds weight processing time. Simple to Use – Reduces operator training time. DuraBridge® Technology – Reduces overall scale deflection to less than 1/2” when a full load is applied. I/O Port – Allows for connection to a computer. RS-232, bidirectional, configurable 1200 – 19,200 baud. Transmits weight and scale status whenever "W" command is sent by remote device. High resolution "H" command accesses 10 times displayed resolution. Construction – Stainless steel weigh platter. Painted mild steel base enclosure. ZERO – With Auto Zero tracking for zeroing the scale. TEST – Runs a diagnostic program to assure scale is fully functional. Power – Recessed power supply with standard wall plug. Large Weigh Platter – Easily accommodates oversize parcels. Versatile – Can be set up in either decimal pounds or kilogram mode. RS-232 Cable – Allows you to connect to a PC. Power: 120 VAC (+10%-15%), 60 Hz, standard 3-wire ground. RS-232 10' Interface Cable (9 Pin to 9 Pin) included with each scale. Ball-top Weigh Platter – Simplifies transport of all parcels. Ideal for conveyor lines. One piece lift-off design equipped with 25 balls. Remote Display – 1/2” H, six-digit LCD display housed in a molded enclosure with a 7 ft. cable. International Power Supply – 230 VAC, 50 Hz power supply. End of cable terminated with a universal conductor.